Google celebrates its 15th anniversary of search with the rollout of its "Hummingbird" search algorithm. For years, search engines have trained us to speak in certain cadences, using certain words, and to pick out our own results from a list of relevant queries. Google's new Hummingbird algorithm strides further away from that, to a more natural interaction with a search engine. Hummingbird, which has crept into Google's search engine for about a month now, provides better answers to more complex queries, the search company's executives say. Over time, Google has continued poaching pageviews away from content partners by answering more and more questions itself; that trend appears to be continuing with Google's latest improvements. 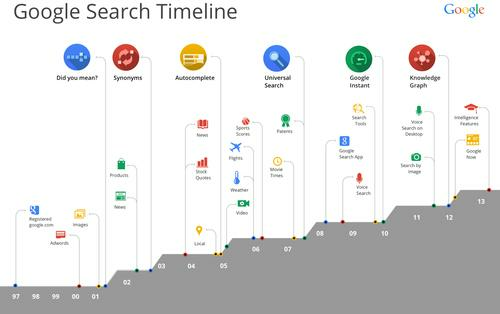 To celebrate 15 years in the search business, Google highlighted the next step in its roadmap: intelligence features, going beyond some of the anticipatory work Google enabled with its Google Now offering. The current design actually plays more into the mobile space than on the desktop, with two new innovations specifically designed to return answers, not results: a new comparison engine, and better filters that leads more naturally into a "conversation" with Google on your mobile device. Google hosted a press event at its "Google garage,"--the Mountain View, Calif. home originally rented to Larry Page and Sergey Brin by Anne Wojcicki, before she married Brin. As an example of the new comparison engine, Google suggested users ask Google to "compare butter with olive oil" or "compare Earth vs. Neptune". Comparisons have traditionally one of the strong points of rival search engine Wolfram Alpha, so it's interesting to see Google take a stab at ousting Wolfram from one of its traditional strengths. With the new filters, users can command their phone to "tell me more about Impressionist artists," where Google will provide more context about the artists, as well as some alternative genres. While Google hasn't quite copied Bing, it is interesting to note the similarities in context and design between Google's example in the mobile space and what Microsoft's Bing search on the desktop returns. Google also promised a "single, more unified design" in its mobile search app--again, with an emphasis on providing its own answers, not results. "We'll keep improving Google Search so it does a little bit more of the hard work for you," Amit Singhal, senior vice president for search at Google, wrote in a blog post. "This means giving you the best possible answers, making it easy to have a conversation and helping out before you even have to ask. Hopefully, we'll save you a few minutes of hassle each day. So keep asking Google tougher questions--it keeps us on our toes! After all, we're just getting started."